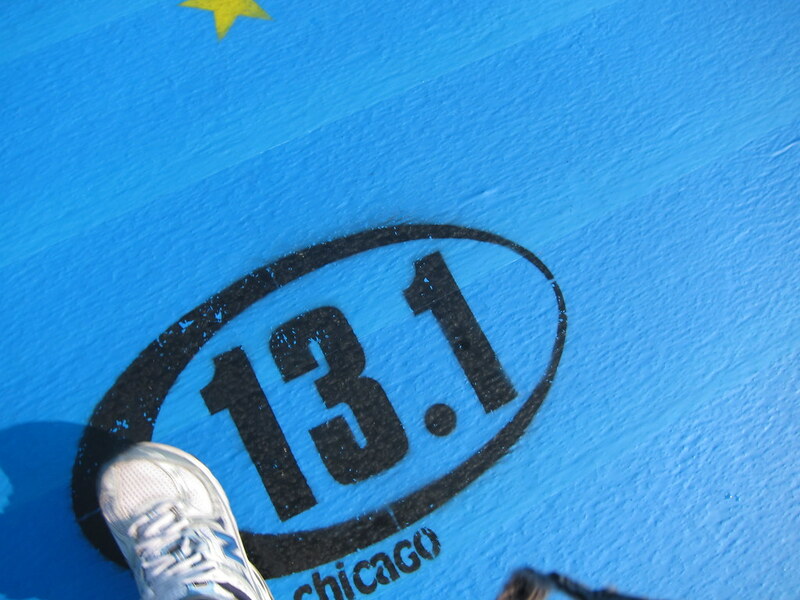 The Green Girl's 13.1 Chicago adventure began when she won a race entry from Tim from 26.2 Quest. 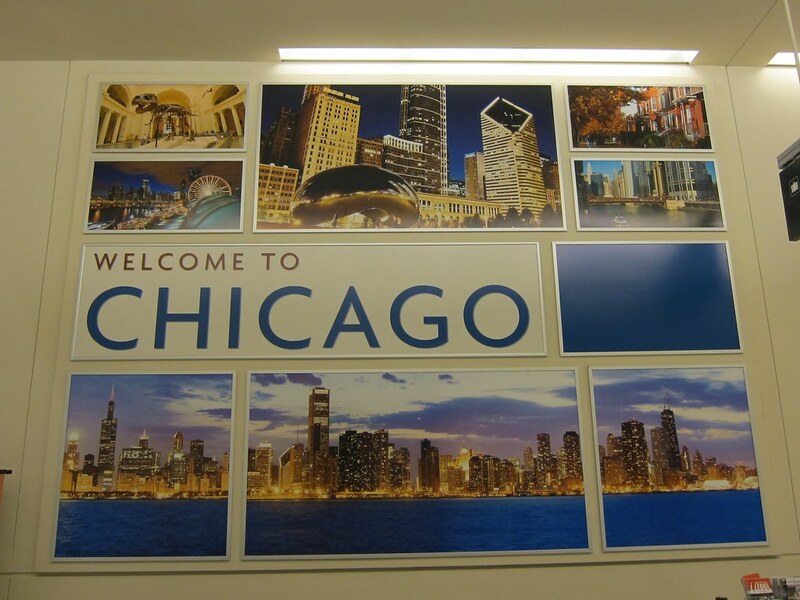 After work on Friday, I flew out of LAX and landed at MDW just before midnight. I checked into a motel and slept for an hour before I headed over to the Museum of Science and Technology. On the shuttle to the starting line, I met a runner named Moses from Wisconsin. As I mentioned in my race report, I was at 7.47 miles when the course was Black Flagged due to the hot and humid weather conditions. We also received the somber news that a runner had lost their life. We were transported back to the Finish Line where we ran down the chute and collected the medals we didn't actually earn. 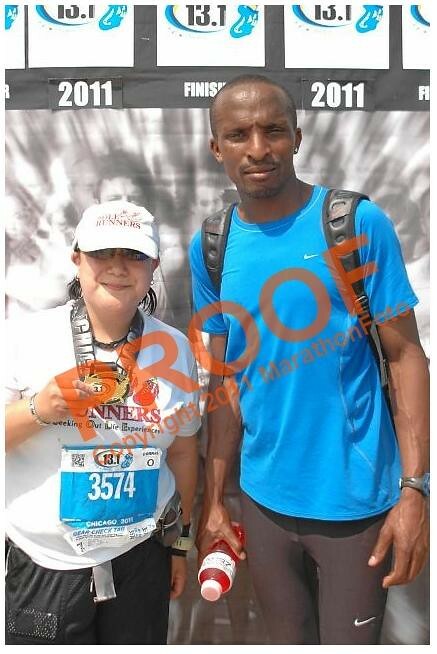 In the finisher's area, I saw Moses and he told me he had won and Jill had placed fourth. Moses and I grabbed slices of Lou Malnati's pizza and found a shady spot to relax. The conversation came easily as it always seems to when you are among other runners. Our first topic was, of course, running. We discussed the High Altitude Training Centre (HATC) in Eldoret, Kenya. I got excited when Daniel Kirwa walked by and gave Moses a nod. I had to remind myself that these guys were friends. After we ate, I followed Moses as he went to claim his first place award and prize money. We walked around and then headed down to the Lake Michigan beach. We sat on the cement wall and people watched as we chatted. We talked about other elite runners. We discussed the tragic loss of Sammy Wanjiru. It was almost surreal to me that I was talking to someone who knew Sammy personally. I showed him the pictures I had taken out on the course and he was shocked that I was able to snap shots while running. He asked me where I carry the camera and I explained how I store it in my hydration belt. He asked me if I just pull it out and click and when I nodded my head, he stared at me in amazement. I couldn't help but laugh when I realized in many ways, he was in as much awe of me as I was of him. On my flight back home, I kept replaying the events of the day in my head. It was truly the perfect ending to a less than perfect race day. Hi GG! Did you snap pictures of Lake Michigan? Seems like you had great fun! lol I love it! I wonder how much of the course they actually get to "see" when they are that fast. Kwim? Very interesting! love this. and i love that pic of you and moses. You make it all just perfect with this report of that not perfect day, thanks! Don't you love those by chance encounters. SO fun and off the cuff. Unfortunately for me it's always been on an airplane so it's limited in scope. Awesome how you guys ate pizza and hung at the beach. Worth the whirlwind travel and no sleep, I think. YAY for making fab friends. love this. Wow, Greenie! I'm jealous of your new friend! wth ?? moses ! you are a rock star. Wow, sorry that you weren't able to finish, but that heat sounded dreadful. What a day and new friend made! I also am in awe of your running photography skills. I can't even really get an okay shot when I stop and stand still. What a cool story about you and Moses! Loved it! I'm glad that Moses made your trip here to Chicago worthwhile and memorable! I'm in awe of you! Very funny comment on my Blog just now miss green smarty pants. This post was awesome. What a cool experience to meet someone as rad as Moses. Loved hanging with ya, you're the best!! What a great post!!! Love taking pics during races.... if you're not going to win, why not capture the moments. Beautiful post from a tragic event. I love that they are as in awe of us back of pack as we are of them!